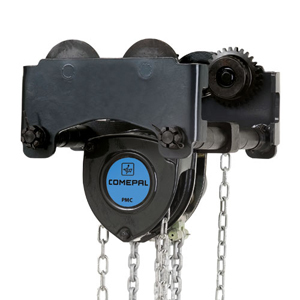 Belonging to the COMEPAL range, COMEPAL PMC HPR manual chain hoists allow heavy loads lifting and moving. Combined with a manual chain driven travelling trolley, they ensure the lifting by handwheel and chain and they are intended for use in low headroom environments. Available with stainless hook and chain, they will satisfy your needs for applications in more aggressive outdoor environments. Low headroom trolley combined with manual chain hoist COMEPAL PMC type. Controlled via handwheel and chain. Trolley adjustable according to beam size up to 300 mm width. Trolley plates in high-resistance steel. Steel rollers machined and compatible with all types of I and H beams. Bearings lubricated for life (without maintenance). Other lifting heights and capacities on request. Push trolley available on request. Wider flanges than 300 mm.